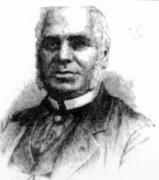 John Carey was born at Duneane, County Antrim, was educated at the Royal Belfast Academical Institution, and became a Presbyterian minister in Ballymena. He claimed he was a descendant of the sister of Anne Boleyn. In 1839 he was minister of Albany, County Tyrone. He later moved to Brookvale Presbyterian church in County Down. He was involved in a shooting incident, and though he was arrested, lack of evidence led to his release. It is unclear how he spent the next seven years. In 1850 he went to live in Rarity Cottage, Toome. He earned a reputation during the Famine of lending money at extortionate rates of interest, but, at the same time he was said to have been a benefactor to the destitute. He erected a fine pump in Toome and built a small schoolhouse, but it is his 'Temple of Liberty, Learning and Select Amusement' for which he is remembered. This extraordinary building had seating for one thousand five hundred people and had a fine organ and a fifty-candle chandelier. Its library contained five thousand books. It survived until 1910, when it was burnt to the ground.